Evan Akuna is a 2010 graduate of James B. 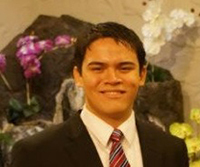 Castle High School on O‘ahu, and is currently a senior at UH Manoa working toward his B.S. in Mechanical Engineering, with a minor in Business Administration. After obtaining his bachelor’s degree, Evan plans to enter the field of structural design in an aerospace-related field, and later obtain his Professional Engineering license. In his spare time, Evan enjoys hiking, good food, and almost anything fitness-related. Project Abstract: The Thirty Meter Telescope (TMT) on the summit of Mauna Kea will be comprised of a segmented primary mirror (M1), a secondary mirror (M2), and a tertiary mirror (M3). M1 will consist of 492 mirror segments, plus 82 spare segments that can be exchanged for maintenance, for a total of 574 polished mirror assemblies (PMA). Each 220-kg PMA includes a 67-kg segment support assembly (SSA) that will hold the mirror segment in position during telescope operation. This project is focused on creating a shipping container design that will be able to safely and economically transport all SSAs and PMAs from their various points of manufacture to the observatory in Hawai‘i. The container must isolate and protect its contents from vibrations, shocks, and environments that are associated with transportation, handling, and storage of the PMA and SSA, while allowing for ease of loading, unloading, and inspection of the assemblies. The container must also record any excess levels of mishandling to indicate carrier or shipper negligence, while allowing international customs officials to inspect the containers. Our developed design is based off of a prototype shipping container, military specifications, and international shipping standards. A final design review will be held before a panel of senior engineers at TMT to confirm preliminary designs and calculations, as well as qualification testing methods for prototypes of this design. Once approved, 600 shipping containers are to be built for the project in India, and will be transported to various producers of the SSA and PMA.